Our capabilities for GMP Aseptic Filling of Oligonucleotides will support your pharmaceutical drug development process as it advances through clinical trials and on to commercial production. 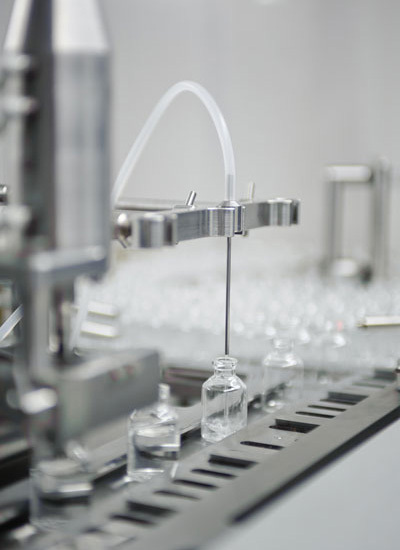 Our pharmaceutical cGMP Manufacturing Facility handles both aseptic liquid filling and aseptic powder filling into vials. Dalton uses peristaltic filling equipment with low hold up volumes to ensure that losses on filling your valuable drug product are reduced. The aseptic fill suite maintains a local Grade A (ISO Class 5) environment for the filling operations. Our Microbiology Laboratory routinely monitors all areas of our cGMP aseptic processing facility for viable airborne contamination, viable contamination on surfaces and non-viable airborne contamination. We are flexible and committed to the success of your oligonucleotide program and pharmaceutical drug development program. While other sterile fill companies may impose a requirement for a minimum number of vials, Dalton welcomes small scale aseptic fills to move you quickly into the clinic and help you achieve key milestones. Dalton offers fully integrated GMP Aseptic Filling and capping of liquid in-vial injectable drugs, and aseptic powder filling and capping for preclinical and early stage clinical trials. Sterile Liquid Injectables: Aseptic fill on a state-of-the-art fill / finish crimp-cap line, capable of aseptic filling vials from 1 to 125 ml. We have validated processes in place for sterile filling 2, 3, 5, and 20 ml vials up to 15,000 units per run. Supporting our process equipment are validated services including a WFI system, pure steam generator, autoclave and depyrogenation oven. Validation capabilities include, but are not limited to, aseptic fill simulation studies, terminal sterilization loads, autoclave loads, depyrogenation oven loads, container closure integrity and process validation. Dalton also has the ability to develop or transfer technology related to aseptic processing. In addition, Dalton’s analytical service laboratory offers method development, validation and ICH stability programs to its clients. QC/QA and Microbiology functions support our sterile manufacturing services. Dalton is currently manufacturing and filling sterile clinical trial products under cGMP. Our aseptic fill finish team will be an extension of your company and we will serve as a reliable and responsive partner to get you through the clinical trial process faster.